This is a follow up to Tunnel Vision. Ash closed her eyes, and turned her focus inward, searching. “I don’t know,” she said, finally. “I can’t tell if it’s that, or just basic instinct. But there is something off around here.” She opened her eyes again, walking to the mouth of the tunnel. A cool puff of wind twined around her neck, ruffling the choppy edges of her hair at the back of her neck. She lifted her hand, trailing her fingers through the current of air as it passed by, and frowning when she felt the way it suddenly shifted. Instead of continuing on its path, it turned back, curling around her like a child in need of comfort. “What-?” Behind her, she heard Sarika’s footsteps as she moved closer. Pushing the sound away, Ash concentrated on the quicksilver flashes of emotion the wind buffeted her with. Anger, distress, fear…so much fear. And underneath it all, sorrow. She bowed her head. Sarika stared back at her for a moment, face blank. Then she lunged. Ash didn’t fight as she felt her sister’s fingers dig into her shoulder. The familiar sensation of being pulled through a tunnel of air surrounded her, and then she was stumbling, tripping after Sarika out of an alley and down the stairs of a nearby subway station. As she caught up, she heard her sister muttering under her breath, curses in English spattered throughout their native Hindi. Bright purple petunias poked up between the cracks in the sidewalk as they passed. World building: Keep it together! I’ve recently began helping a friend build a world for a novel she’s working on, and I figured I’d pass on my suggestions to other beginning world builders. Please note: this isn’t about the building of the world, itself. That will come later. This is about making things easier on you, the Builder of Worlds, as you begin your path to nerdy (or so I’ve been told) glory. Think of it like a shopping list, if you will. Before I get started though, I feel I should explain that I am OCD as hell when it comes to organizing, and it carries over to my world building, so by all means, tailor the following suggestions for your own needs. It doesn’t have to be fancy, but trust me, it will make your life a lot easier.Now, binders come in different sizes, and different…forms, I guess you could say. There are hard back binders and floppy plastic ones (you’ll see what I mean the minute you start looking at them). So you’ll need to think carefully about what kind of world you’re building, and what all you will need to go into the details of. For example, in my Etlan series, I have multiple houses, and some of those houses have other houses they’re responsible for. I also have certain skill based powers, and elemental powers. It has its own language that I’m having to create, including spells and texts. Then there’s the research I’ve done for all of the above. With all of that information, I needed to get a good sized binder. The one I’m currently using for Etlan is 2 or 3 inches, and has a hard cover. It was more expensive than I preferred, but I splurged on it anyway because I needed one that was going to last. The one I have for “Say ‘No!’ to Zombies,” on the other hand, is only a 1 inch binder, and I think I got it at the dollar store. The reason for this is simple: not as much information needed. I have their supply list, the traits of the zombies, the timeline, and basic character profiles, and I still have plenty of room left over for any other details I might think of later. I’ll probably be able to use that single binder for all four works I have planned in the series, and then some, if I wanted. Think it out, plan it out. Dividers (tabs) are your friend. Again, tailor this to your need. SN!tZ currently only needs four tabs, and that’s stretching it. Etlan, on the other hand, has over 30, and I’m not done organizing yet. Seriously, this thing is a monster! 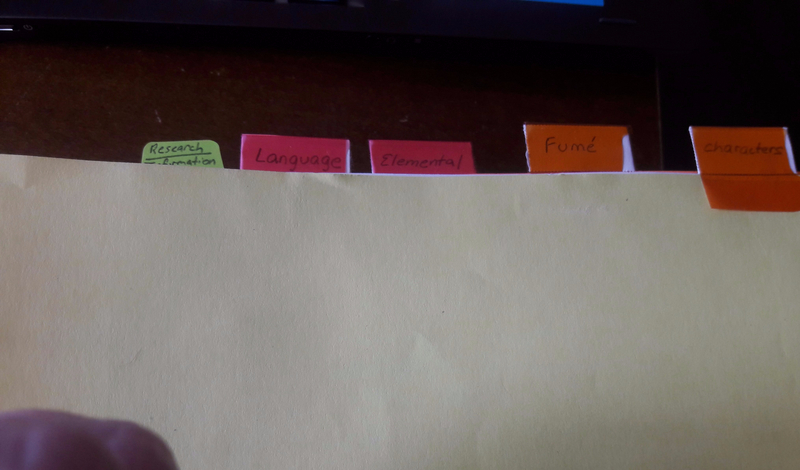 I ended up having to make dividers of my own, because I wanted half-sized tabs and to have tabs at the top. Most of the dividers that come with tabs on top, have tabs that are just too big for what I need. If you aren’t picky, however, any old divider will do (I recommend taking advantage of “Back to School” sales). Get a bunch of the regular dividers and have fun with it. There are dividers that have write-on tabs – I do not recommend those. They start out fine, but if you make a mistake, you’re out of luck, unless you use pencil (which tends to smear), or keep white-out on hand. Personally, it’s just not worth it, especially when the cheapo dividers work just fine, and you can get them for about a dollar at Walmart or Amazon. There are also dividers that come with pockets. Those can be very useful as well, especially if you’re a person who jots down notes on anything you happen to have nearby. You can just slip them into the pocket in the right category, and there ya’ go. I would suggest copying the notes down onto an actual piece of paper and putting in the binder, but that is entirely up to you. You’ll end up paying a little bit more for the tabs with pockets, so consider your budget carefully before you go on a buying spree. A word of caution: Beware the Table of Contents! I know it’s tempting to make one, but unless you are 100% sure of the way you have everything organized, it is in your best interest to stay far –far- away from a Table of Contents. If you are not completely certain about the way you have the binder set up, or if there is even the slightest chance that you might add something/remove something do not make a Table of Contents. Everytime you add something or move something, etc., you will have to redo the ToC. It is time consuming and just not worth it. Wait until you’re done with that world (or at least the first book in that world), before you even think about making a ToC or an index. Seriously.This is one of the most important things when it comes to world building (besides the world itself). The more complex your world, the more you will need to make sure you have your stuff organized. One of the most aggravating things, as a reader, is when it’s like the author doesn’t remember the rules of their own world. If a certain race only has blue or green skin, do not introduce a being of that race that is, oh, I don’t know, yellow, without some kind of explanation (skin disease; mutation; crossbreed, etc.). You might think “Oh, no one will notice. They probably didn’t pay any attention to the different races.” To that, I say: ask a reader about the differences between a Tolkien elf and an elf from the Shannara Chronicles. Just warn me ahead of time, so I can pop me some popcorn. I would also suggest using the bathroom and clearing your schedule first. The bottom line is, a dedicated reader/fan will notice the differences. PLAN IT OUT.I know I’ve already said this a couple times, but I cannot emphasize this enough, and I am speaking from experience. I have reorganized my Etlan binder so many times, it’s ridiculous. Granted, that was because I started out with only one set of dividers, and had to work with what I had, but that is why I’m telling you now: get LOTS of dividers. You might end up not using them all, but it’s better to have them and not need them, than to have to reorganize the information a couple hundred times. The best thing to do, before you start buying anything, is to sit down, either with pen and paper or with a document and start outlining what you need to organize. Use your outline to determine how many tabs you’ll need to buy. If the number is over 30 like mine, I would suggest making your own. If enough people are interested, I’ll post some instructions on how to do that. Try not to over organize. That was one of the mistakes I made in the beginning. Believe me, it is possible to go overboard with this stuff, and it’s a pain to fix. Keep it simple. If anyone else has their own tips and tricks for keeping information straight, feel free to let me know in the comments.